I know it is cliché to say pizza is one of my favorite foods, but it’s true, homemade pizza will always be on my top 5 favorite dishes! What I love most about making pizza from scratch is that you can add almost ANYTHING to it – all of the veggies you want! 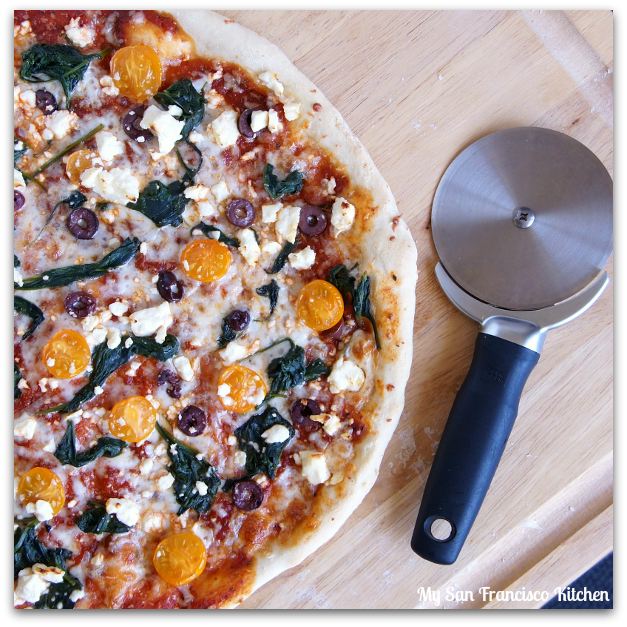 This homemade Greek pizza recipe is made with spinach, feta cheese, tomatoes and olives. It makes one large pizza (16 inches), but you can double the recipe to make two. I try not to use a lot of cheese, so feel free to increase the amounts of the toppings to your preference! GIVEAWAY! Our friends at Super Peel® generously offered to send one reader a free Super Peel®. All you have to do to enter is submit your email address via the Rafflecopter widget below, and leave a comment answering the question “What is your favorite pizza?” You can earn additional “entry points” by completing other tasks outlined for you on the widget below. One winner will be chosen via Random.org. The more entries you have, the better chance you have to win! You must have a U.S. shipping address to enter, sorry! Giveaway ends 10/01/13 at midnight, and the winner will be notified via email. Good luck! After you have prepared your dough, toss it or roll it out to the desired thickness and place the edge onto the edge of the Super Peel® (this step is not necessary – if the dough is sticky, the Super Peel® will pick it up easily just by placing it next to the dough). Slide the Super Peel® underneath the dough at the same time as pulling the clipped bar up to the top of the peel. Transfer the dough onto your pan and dress it up with toppings! After it is done baking, place the edges of the crust onto the Super Peel® and slide the peel underneath while pulling the clipped bar up. Wa-lah! You have a perfect, mess-free pizza! Add water, yeast and sugar to a bowl and let stand 7 minutes to activate the yeast. Add salt, olive oil, and half of the flour. Stir. Add the remaining flour a little at a time while stirring. 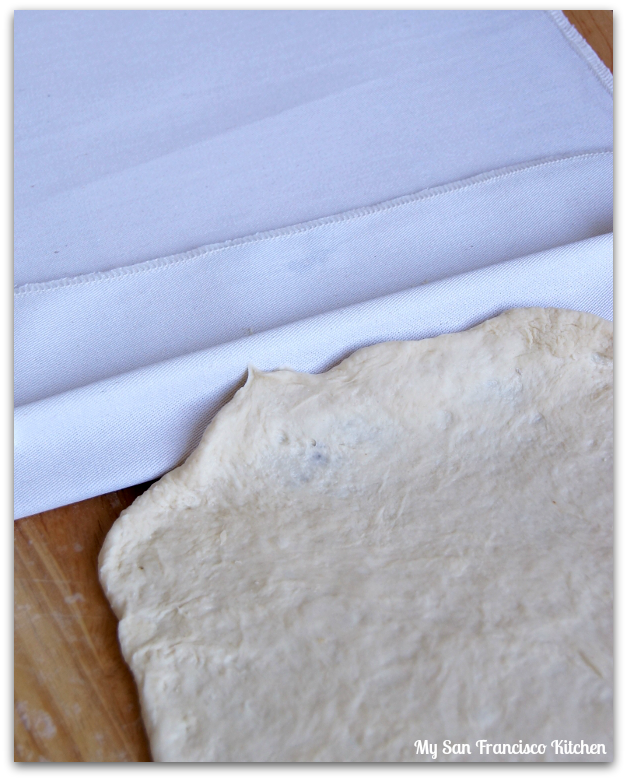 Dough should not be very sticky - add more flour until it is elastic and does not stick a lot to your hands. Let rest for 2 hours, covered. 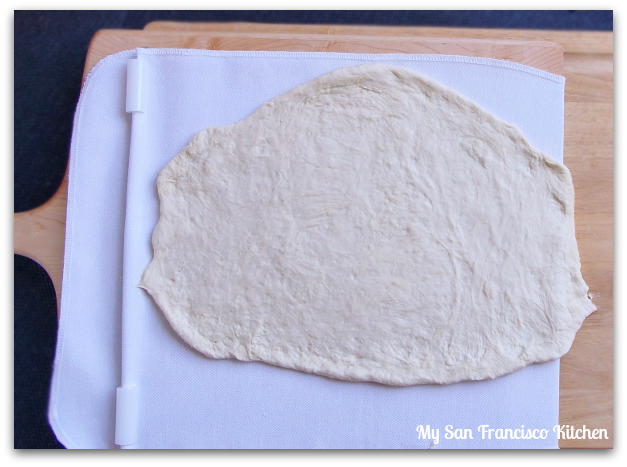 Roll out to desired thickness, then transfer to a greased pizza pan. 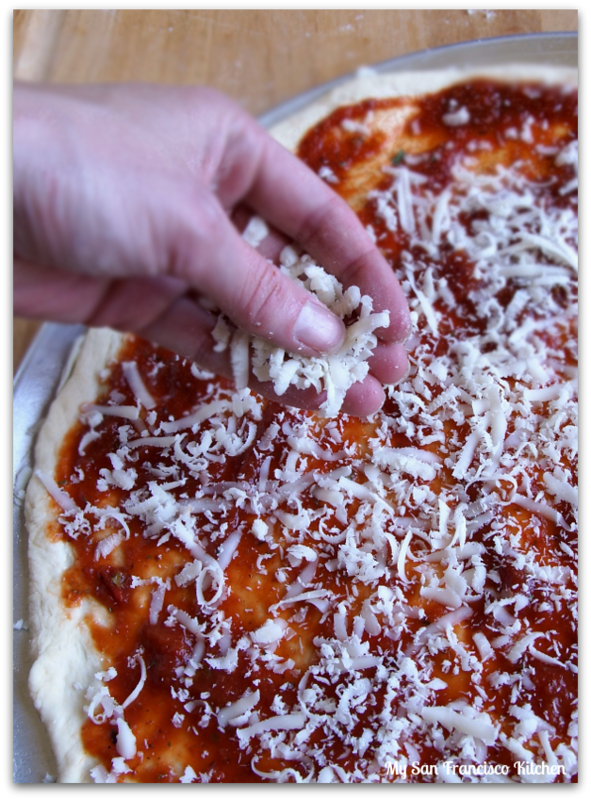 Spread the pizza sauce over the crust, then top with remaining ingredients. Bake for 15-20 minutes, until cheese just begins to slightly brown (for a crispier crust). Cool 3 minutes before transferring to a cutting board and serving. Disclaimer: A Super Peel® was provided for review. All opinions in this review are my own. 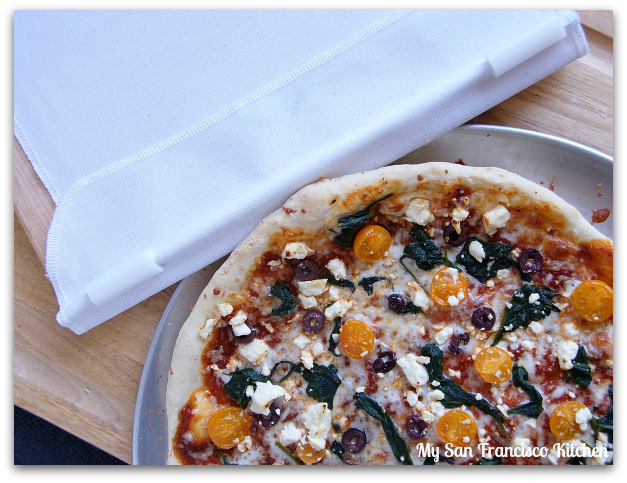 This entry was posted in Uncategorized and tagged feta cheese, olives, pizza, spinach, tomatoes. My favorite pizza changes from day to day. I like many different combinations, and I also like just plain cheese. My mood, what I have on hand and my imagination are what drive me. Homemade pizza is the best! And yours looks so terrific. 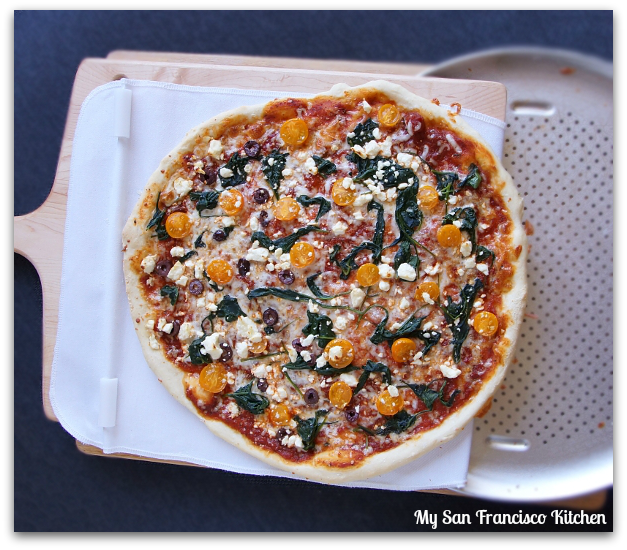 I really need to make more pizza – I almost never do. Mainly because we live really close to 3 different (and terrific!) pizza places, so it’s so easy to order take out. Lazy, I know! My favorite pizza is loaded – veggies, meats, and LOTS of cheese. BBQ chicken is a close second! Love the tang from the feta cheese! Wow, what a cool gizmo! And your Greek pizza looks terrific! I love loads of pepperoni and cheese! My favorite pizza is pepperoni, bacon, Canadian bacon, onion, red bell pepper, mushroom, mozzarella and cheddar. Ooh I LOVE homemade pizza…and at the pizza place that we used to order from, we’d always get Greek salad on the side, so this combo brings back great memories 🙂 My fav pizza is probably this southwestern one I made with my friends once–black beans, corn, mexican cheese blend, salsa and red onion. Kind of strange, but SO GOOD! I am with you on home made pizza too, love it. This looks so fresh and healthy. Love the thin crust and that’s a cool gizmo right there. Veggie is my favorite. Depending upon what my garden is producing, I like zucchini, tomatoes, onions, some fresh herbs…maybe some mushrooms. Greek pizza sounds delicious too, I’ll have to try it! I like ricotta with mushrooms and bacon! White garlic chicken with spinach pizza! I love to make an all homemade veggie pizza, including homemade crust. I have a stone put not a peel. This pizza looks delicious. My favorite is mushroom and onion. My fave is ham n pineapple! I love supreme with lots of onions! I love just extra cheese! The dough pizza that you give the receipt. It is so best , My family and I ate all up. We are so full. So nice to taste is best than take away. Thumb up!!!! While I am not the best cook in the world here and in order to avoid myself any kind of frustration could their be an error in the flour measurement of only 1 cup 1/4 for such a large pizza (16 inch). Nope, that is the correct amount!